CST Fabricated Lift Blocks are the perfect solution if you're looking to raise the rear of your Toyota Tundra. You'll quickly and safely add 3" of rear lift. Installation takes approx. 1 hour and is fairly simple. The part number for this item is CSS-T14-3 and it fits 2007-2013 Toyota Tundra Trucks, lifting the REAR of the truck 3". 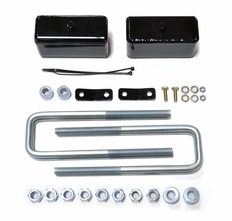 A carrier bracket is also included with this kit to make for a safe and complete installation.